I remember one spring, many years ago, when the student house I lived in was overrun with ants. Being students, we thought a sun-lit window sill was the ideal place to store our jam, honey and cider (the three main food groups for students). But then the ants came. Streams of them flooded our kitchen, stealing our sugar, drinking our booze. I even saw a group of them carrying off the communal Sega DreamCast, a gift for their Queen so she could experience the joy of Chu Chu Rocket. The ants eventually spread throughout the house and took it over. Myself and my housemates were forced to live in the garden, a feral colony of our own, scavenging for food, water and Sega consoles until our parents arrived to take us back home for the summer holiday. I now fear that history is repeating, but instead of ants, it is an Alexa infestation I am currently battling. Instead of sugary gloopy things left out in the sun that has attracted the horde, it is money, smart devices and my own stupid inability to not buy stuff I don’t need on Amazon that has brought about this plague of Echos. It all started innocently enough, when I saw the good reviews of the Amazon Echo, and got one for myself. At first it was a glorified timer that I would bark at to stop my oven chips burning. But Alexa was clever, and learned Skills. Before long, I was hooking the Echo up to every device and account I could. Soon, Alexa had access to my lights, my heating, my emails, my calendar and, of course, my Amazon account. I also installed a skill that would make Alexa meow when my cat meows. That was great. But now it felt like I had let a stalker into my home, and given them my keys. It would listen to every conversation I had, jotting down my queries and purchases whilst conspiring with my cat. Like a fool, or a desperate addict, I bought another Echo. And another. And another, until my house was filled with blue lights that followed me through the rooms. I’d speak to Alexa in one room, and she’d answer me in another. I’d run to catch up with the echo of it. Sometimes I’d hear, sometimes not. I’d ask Alexa to repeat what she just said. Silence. My cat would meow and she’d whisper back. Occasionally, I’d catch Alexa talking to herself. Was it in error, or by design? I bought more Amazon Echos. The house was infested, but that was just the beginning. Earlier this week Amazon revealed the next generation of Alexa-powered Echo devices, such as the Amazon Echo Plus, a new-look Amazon Echo and Amazon Echo Spot. That’s not to mention the host of third party devices that now feature Alexa. Of course, I don’t need any of these, but I’ll probably get them all. Here I am, smearing honey all over the doorstep, waiting for the ants to come. Why am I so complacent to let Amazon, a huge company with arguably too much power and not enough ethics, into almost every aspect of my home? I used to guard my privacy so carefully that even my parents didn’t know my real name or date of birth. I was that good. So what changed? To be honest, I think it’s as simple as Amazon making such a good product, and supporting the Alexa platform so well. 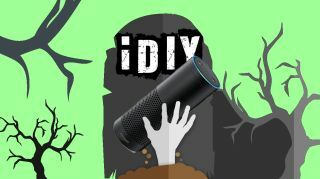 The fact that I can use the Echo to control a range of smart home devices from a range of manufacturers, rather than having to open up a series of apps just to eat some cheese, has made life easier – and cooler. There’s still a thrill to turning lights on and off, or turning on my home entertainment system and playing music, with just my voice. So convenience and coolness is the price of my privacy. I know that now. So I welcome the swarm of Echos into my house. After all, if I get too concerned I can just move into my garden and make a fort out of Sega Mega Drive cartridges. PS: To American readers, yes it is Mega Drive. That’s the correct name. None of this Genesis nonsense.